See Also: Cameron Morrison - Dictionary of North Carolina Biography, Governor Cameron Morrison - Research Branch, NC Office of Archives and History; First Ladies and Gentlemen of North Carolina NCpedia collection. Having lost her mother, Lottie May Tomlinson Morrison, in 1919, Angelia Lawrance Morrison excitedly accepted the role of “little mistress of the mansion” when her father, Governor Cameron Morrison, was inaugurated on January 12, 1921. Accompanying her father and his sisters Ida Morrison and Ada Morrison Nuttall, as well as three hundred residents of Charlotte, on a train to Raleigh, Angelia was the center of attention. By all accounts she was at her father’s side during all of the day’s events, from breakfast aboard the train to the ball that evening. Upon her initial arrival at the Executive Mansion, Angelia Morrison emerged from a limousine along with her father, surveyed the outgoing Governor and Mrs. Bickett, then ran up the stairs, meeting the first lady with open arms, and proceeded to hug and kiss her and then the governor. 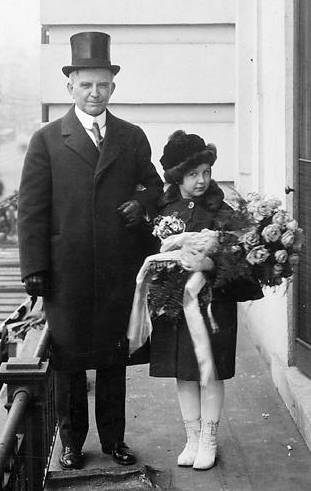 Attired in brown velvet dress, coat and hat with matching kid gloves, and a corsage of sweet peas and lilies of the valley, Miss Morrison proceeded into the city auditorium on the arms of both her father and Governor Bickett. Following the inaugural ceremony, a group of ladies from Charlotte presented a large bouquet of American Beauty roses to Governor Morrison, who then handed them to Angelia. The Morrisons returned to the Executive Mansion for luncheon with the immediate family. Dinner that evening had been prepared and left ready by Mrs. Bickett, who had also readied the rest of the mansion for the incoming family – even to decorating a room especially for the eight-year-old first lady. From 8:30 to 10:30 PM there were receptions at the Executive Mansion and at the Woman’s Club of Raleigh, and at both Angelia Morrison stood proudly next to her father shaking hands with well-wishers. She was dressed, according to the Charlotte Observer of January 14, 1921, in "an exquisite frock of soft white silk and lace with her hair tied with a big white satin bow and slippers and stockings of white. She wore a corsage of white rosebuds and lilies of the valley." The newspaper further described the child as " resplendent almost in every detail. On the car, on the stage, at lunch, in the receiving line at the ball last night, she was almost the central figure. The state likes Angelia and it welcomed her with cour­tesies probably exceeding any ever accorded a child of Carolina." Governor Morrison continued to keep his only child involved in his active life, allowing her to accompany him as often as possible. Angelia traveled with her father throughout the state and participated in a variety of activities expected of a first lady. Whenever he traveled outside the state, the governor always brought Angelia presents, particularly clothing in his favorite color, red. Cameron and Angelia Morrison's fondness for one another continued throughout his lifetime. When Governor Morrison married Mrs. Sara Virginia Ecker Watts on April 2, 1924, he took his daughter and his sister Ida, along with distinguished members of his administration, to witness the ceremony. Until this second marriage, Angelia and one of the governor's sisters, Ida Morrison, performed the duties of first lady. Also residing at the Executive Mansion during Cameron Morrison's tenure were his secretary, Margaret Willis, and at times his wid­owed sister, Ada Morrison Nuttall. The new Mrs. Morrison commissioned a portrait of Angelia's mother as a present for the child so that she would have her mother ever present in her life. At the end of her father's term in office, Angelia Morrison left the mansion with her aunt Ida Morrison and returned to the family's Charlotte home prior to her father and step­ mother's arrival. Later in life Angelia Morrison inherited Morrocroft, the English manor her father and stepmother built. Angelia Morrison grad­uated from Spence School in New York and attended Sweet Briar College. Her daughter Sara has de­scribed her as having loved people and having never met a stranger. In October 1932 Angelia married James Jackson Harris and reared four children- James Jackson Harris Jr., born May 2, 1936 (died 1990); Sara Harris, born May 25, 1938 (married Howard Cary Bissell on May 21, 1960); Cameron Morrison Harris, born December 14, 1943 (married Dorothy Waller on September 6, 1969); and John William Harris, born July 3, 1947 (married Deborah Small on April 25, 1970). She named her only daughter after her beloved stepmother, Sara Ecker Watts Morrison. In 1964 Angelia Morrison Harris opened and actively operated a successful antiques busi­ness in Charlotte. In 1967, at the behest of his wife, Governor Dan K. Moore appointed her to serve as a member of the Executive Mansion Fine Arts Commission. Mrs. Harris's infec­tious spontaneity had a joyous effect on that body's activities. She and generous fellow member Ralph Hanes engaged in uproarious discussions on the pros and cons of Victorian furniture. The committee enjoyed the fun of working with her and gained knowledge from her expertise. Mrs. Harris was also involved in many organizations, among them the Charlotte Debutante Club and Covenant Presbyterian Church. She was a benefactor to Queens College, St. Andrews Presbyterian College, the Mint Museum, and Charlotte Country Day School. Angelia Morrison Harris died on July 13, 1983, at the age of seventy-one. Governor Cameron Morrison and his daughter Angelia on his inauguration. Photograph. Accession #: H.19XX.429.14." 1921. North Carolina Museum of History. (Accessed August 1, 2017).